I’m from Florida and it would not be spring time without seeing strawberry stands all over major and small roads selling some of the most beautifully bright red strawberries you’ve ever seen. They sell them by the pint or flats at such bargain prices too! Not to mention, an array of other strawberry desserts and products like milkshakes, jams, and shortcakes to get you in the “strawberry spirit” of the season. There are also several strawberry fields with signs advertising to “Pick your own” strawberries which makes for a deliciously exciting experience. Seeing such an abundance (and having a flat of strawberries sitting on my kitchen counter) really put me in the mood for some strawberry cupcakes. Immediately I hit the internet looking for a cupcake recipe that would help satisfy my strawberry sweet tooth and help me utilize all of these gorgeous berries. I came across Sprinkles’ Strawberry Cupcakes and thought I would give them a try. Some friends of mine had been asking me if I was going to try to incorporate wheat flour into some of my cupcakes to make them “healthier” and when I came across this recipe, I thought, “Well, why not start here.” So I did. The result, a lightly sweet strawberry flavor cupcake from top to bottom. I used King Arthur’s White Wheat flour so that it wouldn’t change the flavor and density too much. This cupcake was slightly heavier than a typical cupcake, however, the wheat flour wasn’t so pronounced that it took over the entire cupcake profile. Unless you are looking for it, I didn’t think that it was very noticeable. It was just a nice way of welcoming spring time with a cupcake recipe that won’t leave you feeling terribly guilty if you ate one… or two. Native American Indians called strawberries “heart-seed berries” and pounded them into their traditional corn-meal bread. Discovering the great taste of the Native Americans bread, colonists decided to create their own version, which became an American favorite that we all know and love .. Strawberry Shortcake. Seedy characters – On the average, there are 200 tiny seeds in every strawberry. If you’re expecting a baby, you’ll be very interested in some of the new discoveries about folic acid. In fact, 8 strawberries have 20% of the folic acid you need every day. Place strawberries in a small food processor; process until pureed. You should have about 1/2 cup of puree, add a few more strawberries if necessary or save any extra puree for frosting; set aside. In the bowl of an electric mixer fitted with the paddle attachment, cream butter on medium-high speed, until light and fluffy. Gradually add sugar and continue to beat until well combined and fluffy. Reduce the mixer speed to medium and slowly add egg and egg whites until just blended—may look a bit curdled but it’s okay. Divide batter evenly among prepared muffin cups, filling about 2/3 of the way. Transfer muffin tin to oven and bake until tops are just dry to the touch, 15 to 20 minutes or until toothpick comes out clean. Transfer muffin tin to a wire rack and let cupcakes cool completely in tin before icing. If using a dark muffin pan, remember to lower the temperature of the oven at least 20 degrees—I always set my oven to 330 degrees. The dark colored pans absorb heat more and therefore can cook your cupcakes faster and could leave you with dry or burnt cupcakes. If you do not want to incorporate white wheat, you can use all-purpose for this recipe. If you’re unsure how much batter to add to your baking cups, fill only one baking cup and bake it by itself to make sure it doesn’t overflow over the baking cup. 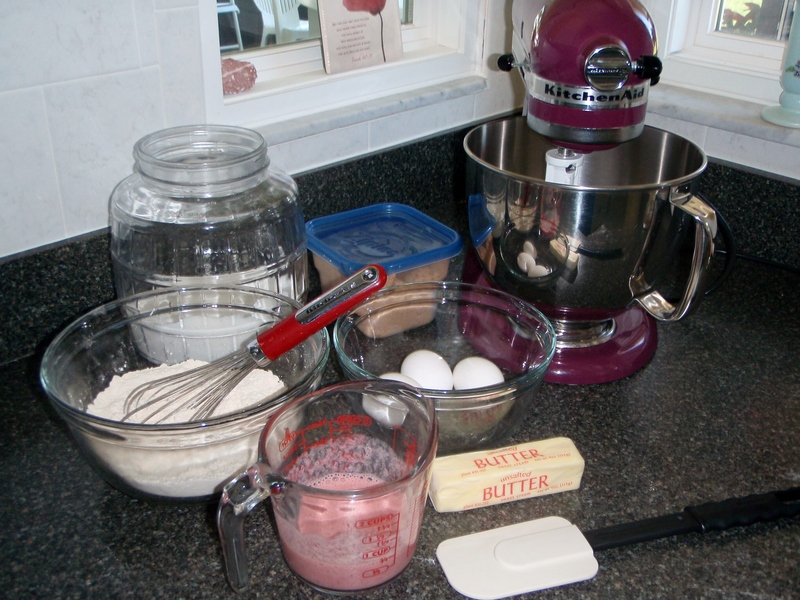 Place strawberries in the bowl of a small food processor; process until pureed. In the bowl of an electric mixer fitted with the paddle attachment, beat together butter and salt on medium speed until light and fluffy, about 4-5 minutes. Reduce mixer speed and slowly add confectioners’ sugar; beat until well combined. Add vanilla and 4 tablespoons strawberry puree (save any remaining strawberry puree for another use); mix until just blended. Do not overmix or frosting will incorporate too much air. Frosting consistency should be dense and creamy, like ice cream. 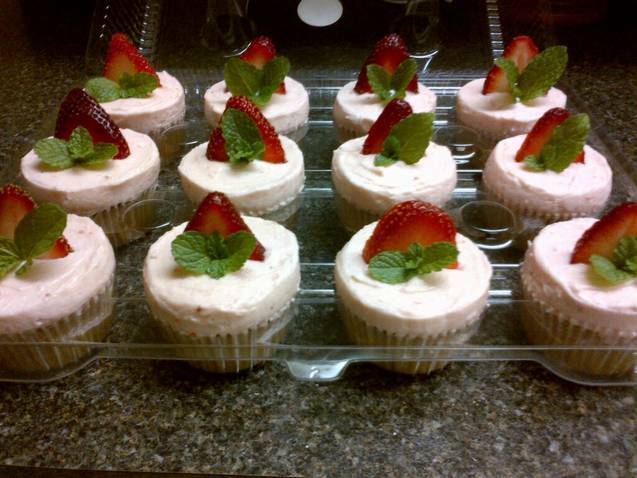 I’ve named these cupcakes “The Pink Ladies”. 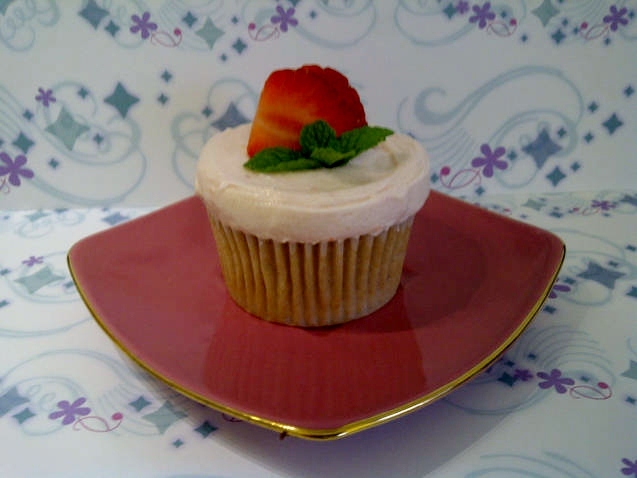 These deliciously wholesome cupcakes are made with unbleached all-purpose and white-wheat flours and are topped with a fresh strawberry buttercream frosting and garnished with strawberry slices and mint. Fresh, wholesome, and delicious, because “Pink” is the word! Available for purchase through LRBK!